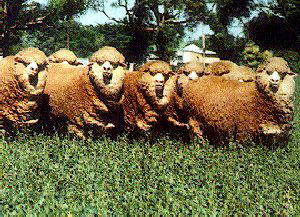 The development of the Australian Poll Merino is relatively new. Recessive poll genes are believed to have existed in the breed for many years and the infusions of hornless sheep during the development of the Merino breed in Australia also left some poll genes within normal Merino flocks. Poll rams have been selected and mated to Merino ewes and selection continued for the quality of pollness. The result is a pure Merino without horns. Poll Merino wethers and rams are less prone to poll strike than horned Merinos and are easier to handle at shearing and crutching time. They are generally large framed, plain bodied sheep that mature quickly. These characteristics make the breed highly fertile, and easy to handle and care for.